← Are You Bettering Yourself Each Year? Today a friend emailed me with a rhetorical question: “Can I just cash out now?” He was referring to his NCAA Bracket where he was in second place in points going into the the NCAA Championship game. The problem for him was he selected Indiana to win and the guy in front of him had Louisville. He was pretty disappointed that he had no chance to win, as no matter what happened tonight he couldn’t win the tournament. My friend was right that he couldn’t win the tournament. However, I answered his question with a “yes” in that he could actually cash out right now. 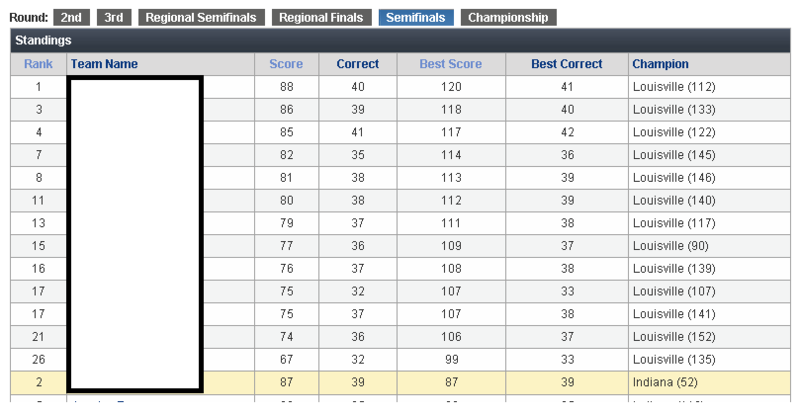 The reason for this is from looking at his screenshot, I could see that no one in the tournament had Michigan winning. Because of that, the scores above do not change when Michigan wins, which would leave my friend with $500 of second place prize money. Meanwhile, he would be left with nothing when Louisville wins. Therefore my friend effectively has a moneyline bet on Michigan that pays $500. Because of that, to cash out he needs to make a synthetically neutral hedge, aka a moneyline bet on Louisville which leaves him with the same amount of money regardless of outcome. How much could he cash out now though, and how much does he need to bet? Shortcut: go here, type in your moneyline with+/-, hit “Convert Odds” and get the Fraction value. This was easy enough to do. I simply googled “Michigan Lousville moneyline odds” to find that Michigan was +159 and Louisville was -180. For those who don’t know, the plus number is the underdog and the minus is the favorite. Plus numbers is how much you get if you bet $100 and the minus number is how much you need to bet to win $100 profit. To convert a plus line number to a fraction divide the number by 100 (+159 in decimal form is 159/100 or 1.59). To convert a minus line number to a decimal, divide 100 by that number (-180 in decimal form is 100/180 or 5/9). The fraction we want to use for this is Louisville’s fraction since they are who we are betting on, 5/9. Thus we can lock in .3571 of $500, or $178.57. Congrats, you have just locked in the profit from your bracket. You can ask friends and try to get an even better price, since you probably won’t have to pay vig, and get an even better payout too. Sorry if this was too low level for the majority of people who read this (professional gamblers), but when my friend asked me this question and I googled to try to find the number to bet, I couldn’t find an equation anywhere so I thought I would post one and keep it low-level. Hope this helps those who find it. Are You Bettering Yourself Each Year?